Instantly recognizable as The Lowenbrau Car, 962-HR1 and its predecessor (962-103) are by far the most successful and recognizable sports cars ever to race in the legendary IMSA GTP Series. Constructed by Holbert Racing under license from Porsche AG, HR1 is also an active tribute to Al Holbert who was, almost inarguably, the greatest sports car driver and team owner of his time. The achievements of HR1 are without parallel and include an incredible three IMSA championships, ten overall wins and eighteen podium finishes. 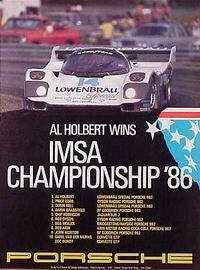 Holberts co-drivers in HR1 were Derek Bell, Chip Robinson and Al Unser, Jr.
1 3 - 1:40.05 Daytona 3hr 12/1/85 Holbert, Unser, Jr.
Chassis: improved Porsche 962 monocoque design and alloy. Constructed by Holbert Engineering. Engine: 3.2 litre, air cooled, six cylinder boxer. Two valves per cylinder.Single turbocharger.Over 750 bhp. Brakes: Brembo vented dual circuit discs with four piston calipers (a 962 first, taken from the Porsche 928). Performance: top speed - over 240 miles per hour.